In a startup when everything’s said and done, win or lose, you will always have your values. Culture is something we think a lot about at Manifold. Who are we as a company, how do we approach work, how do we treat each other and our users? There has been lots of talk lately about startups’ company culture and how it failed its employees. If you do a quick search of company culture in startups you learn that the ping pong table has come to represent company culture’s version of clickbait. It’s an empty promise of culture and fun in an office that draws people in, but you quickly learn it is a facade. The ping pong table has come to represent company culture’s version of clickbait. If you do a search, you’ll find articles with titles like “workplace culture ‘is not a Ping-Pong table’” or “Culture is More Than a Ping Pong Table.” These are only a few of the titles I found when researching startup culture. This is my first job at a startup. Before I started, I’d read stories of startup culture at its worst — with sexism, racism, and hate being at the root of cultures. That’s not the culture I want to be involved in. Those aren’t the only concerns I had when joining a startup. I had no idea what I was getting myself into, but I weighed out my options. Before I made the decision to join Manifold, I asked myself what would I be giving up and what am I gaining by going in a different direction than a corporate or government position. Startups grow or die in a year or two. Choosing a startup, I know this wouldn’t be the same place in 5 years, I knew I wouldn’t have tons of structure, and I knew it wouldn’t be 9–5 Monday to Friday. The stereotypical perks of startup life like nerf gun wars, snack programs, and scootering down the halls aren’t what I’m looking for out of a job. Not that I dislike any of these things, who doesn’t like fun? What I love about startups is the mad dash to launch, people yelling “SHIP IT” from across the room, the rush of sending out our Newsletter to a list that grows every week and Freddie (yes that is his name) the MailChimp monkey high fiving me. Launching, shipping, and sending things keeps us pretty busy; that didn’t mean we didn’t have time to sit down with the whole team and talk about our values as a group. A few weeks ago we did just that and it went well. It’s easy for this kind of conversation to be pushed aside because the value of them doesn’t directly relate to moving the needle but it’s extremely important to have them. I’ve been at Manifold for six months now and it’s not like one day we came in and decided to have values, they were always here. Manifold’s growing and we wanted to get the essence of Manifold into words so they would be easier to share. It’s also a point of reference for the whole team to look at. They are also meant to be aspirational, our best intentions and ideals. 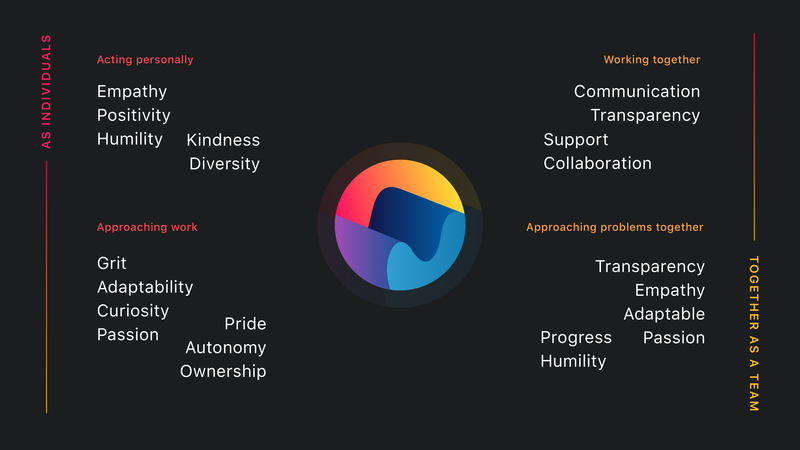 These are not values to think up and put away, so we codified them. These are values the whole team must embody. We also hold each other accountable, we grow and work on getting better. I’m not going to tell you how to pick your values because that’s personal and different for every company. This is me telling you that you need to sit down and do it. It’s conducive to healthy workplace culture. These are the values we will put on the wall, these are values we live and die by as a company. The things I know I’ll look back on are the people I worked with, the work we did, and they way we treated each other. One day we might get a Ping-Pong table but we will never let it be one of our defining features. Our values represent what we want to be on our best days but what we also need to strive for on our worst days. These aren’t values to go on our company page of our website. These are the values we will put on the wall; these are values we live and die by as a company.